Explore incredible places far from the Mushroom Kingdom as you join Mario and his new ally Cappy on a massive, globe-trotting 3D adventure! 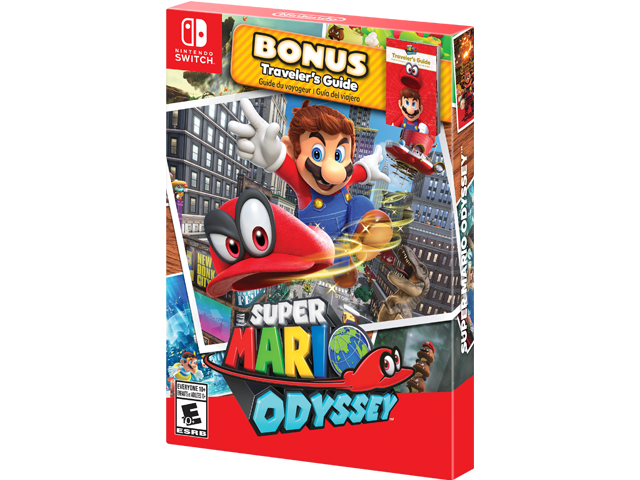 This Starter Pack includes the Super Mario Odyssey™ game for the Nintendo Switch™ system and a Traveler’s Guide book. Use amazing new abilities—like the power to capture and control objects, animals, and enemies—to collect Power Moons so you can power up the Odyssey airship and save Princess Peach from Bowser's wedding plans! Thanks to heroic, hat-shaped Cappy, Mario's got new moves that'll make you rethink his traditional run-and-jump gameplay—like cap jump, cap throw, and capture. Use captured cohorts such as enemies, objects, and animals to progress through the game and uncover loads of hidden collectibles. And if you feel like playing with a friend, just pass them a Joy-Con™ controller! Player 1 controls Mario while Player 2 controls Cappy. This sandbox-style 3D Mario adventure—the first since 1996's beloved Super Mario 64™ and 2002's Nintendo GameCube™ classic Super Mario Sunshine™—is packed with secrets and surprises, plus exciting new kingdoms to explore. Explore astonishing new locales like skyscraper-packed New Donk City to your heart's content, and run into familiar friends and foes as you try to save Princess Peach from Bowser's dastardly wedding plans. Find something interesting? Toss your cap at it and see what happens! There are lots of fun and surprising ways to interact with your surroundings. Hand a Joy-Con™ controller to a friend to enjoy simultaneous multiplayer: Player 1 controls Mario while Player 2 controls Mario's new ally Cappy. Use Snapshot Mode to freeze time while playing the game and take screenshots that you can customize using various options and filters. Screenshots can be shared via social media or uploaded to PCs and smart devices* using all of the Nintendo Switch™ system's built-in screenshot tools.